Part 1 for The Coffeevine August 18 box, in this post I’ll only write about the coffee from Outpost Coffee. In the previous post, you’ve been able to read about the coffee and also what I expect from the coffee. In this part, I’ll share my recipe for an awesome pour-over and Espro travel press as usual. 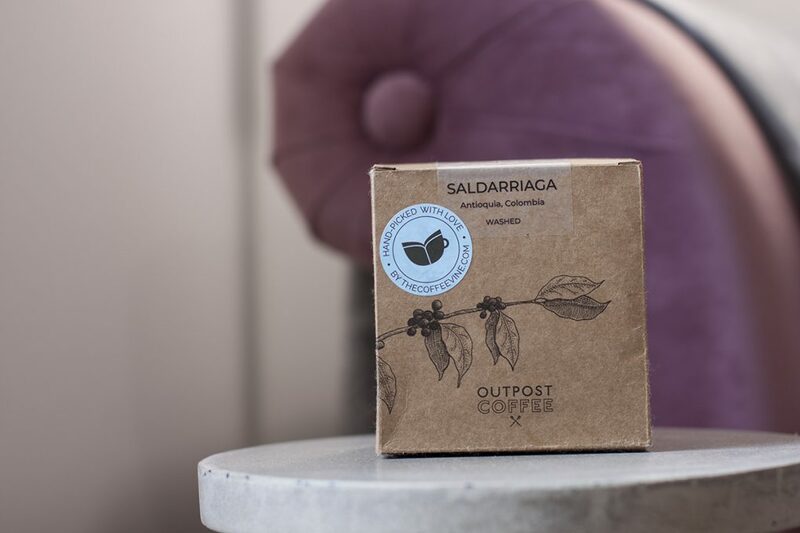 As I was cupping Outpost Coffee – Colombia Saldarriaga I liked how the mellow cherry tones were remarkable! There was also some sweetness described as cola during the coffee roasters cupping of the coffee. I would also like to know how good this coffee would be with “fika”. I tried it with a dark chocolate with sea salt. I understand that this can be a weird thing to try out, as almost all coffees are well matched with chocolate. But there are those who really don’t, and that may mean they are only preferred enjoyed on their own. For example: Do you like green tea with chocolate? I certainly do not. In this case, it was okay. Tones of mellow cherries with a syrupy sweetness. Altitude: 1 400 – 1 800 meters above sea level. A musty coffee with nice cherry tones that have a syrupy sweetness you can recognize from start to finish. I really liked to cup the coffee because many different and interesting notes was presented before me. Like the cherry and a very mild and light syrup. A good coffee when it was brewed as well. If you have an Espro and a Pour-Over … What should you choose to brew with? As I wrote above, you get a more balanced cup with the Espro, you also get a great result every time as it’s impossible to make mistakes. Do you want your cup to show a bit of aromatics, brew with a Hario V60 etc. It becomes more spicy, aromatic and nicer on its own. This time I couldn’t decide, my advice is that you should follow your gut feeling or what you really want to use. For instance, today I brewed with an Espro for breakfast but I’ll probably brew a pour-over later today. Thank you for the coffee Outpost Coffee!